Vatican newspaper paid tribute to the Beatles on 40th anniversary of "White Album"
(CNN) -- When John Lennon remarked in 1966 that the Beatles were then "more popular than Jesus" his comments prompted outrage in the United States. But this weekend the Vatican's newspaper paid tribute to the band on the 40th anniversary of the release of the "White Album" in an article interpreted by some as a papal pardon for Lennon. 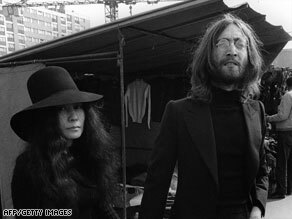 John Lennon appears with wife Yoko Ono in 1968, two years after he made his "more popular than Jesus" comments. CNN's Alessio Vinci spoke to Steve Turner, author "The Gospel According To The Beatles," about the controversy that helped to end the Beatles' touring career. Q: Was Lennon surprised by the storm his comment generated? A: I think John Lennon was surprised because it had been said in a casual way to a journalist who was a personal friend of his and he had no idea it would cause that sort of controversy. When it did happen he was actually quite frightened because they were about to go off on tour and there were these threats to their lives and a clairvoyant made some predictions that their plane would crash. It was really quite frightening and they wanted to cancel the tour but they knew they couldn't. They were under obligation to the tour promoters. And when he made his apology in Chicago, (the band's) press officer told me that John was actually in tears before he went in to make the apology. A: His apology was very carefully worded. He never said "I didn't mean that;" he kind of said, "if it was taken that way, that's not what I meant," but he never actually retracted it. The reason it happened that way, in America particularly, is that people thought the Beatles were getting too big, too proud and it was a way of putting them down and I think people grabbed that opportunity. Q: Did they care at all what the Vatican newspaper had to say at the time? A: I don't know that the Beatles had any particular concern about what the Vatican said. I know the Vatican did say something at the time. But by that time, everybody was pitching in with their opinion, and it just kind of gathered pace. Q: If he were alive, what would he say about his "rehabilitation?" A: It's very hard to say what John Lennon would say now if he knew that the pope had forgiven him or the Catholic Church had forgiven him because on the one hand he wrote to an American evangelist called Oral Roberts and said he had been very sorry. But in a book he said he was very glad that it had happened because it effectively ended the Beatles. Because that tour was so bad that it became the last tour the Beatles ever did. So he thought, "Thank you Jesus for causing this to happen -- because you gave me a solo career." Q: How spiritual were the Beatles? A: The Beatles started out as atheists and agnostics and I think as everybody knows they became more interested in spiritual things. They went out to India in 1968 and I think in a way the Beatles became a spiritual force themselves. And I think that John actually saw that. He saw Christianity and rock 'n' roll as competitors. Only three years later, after 1966, you had the Woodstock festival and you get rock music almost performing a religious function. So I think in a way he was aware of what was happening. The Beatles were almost becoming a religion and exerting a spiritual force over people.